Last week, I posted an article on a Kenyan who had drowned in Neuburg and called on Kenyans to help locate his family. As always Kenyans came out and helped as needed. Although some reports tagged him as Kamau from Kiambu and others from Embu or Kirinyaga, that wasn’t his real name. Cliff was an orphan with two sisters. One sister lives in Germany and the other is in Kenya. 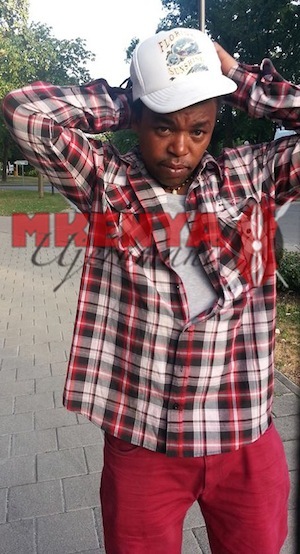 At the time of writing this post, the family has declared Cliff will be buried in Germany and communicated this to the German officials through the Kenyan Embassy in Berlin. The family maintains there will be no collection of funds or memorial services organised. One of his good friends Bernd Duschner, posted the following obituary message in the Donau Kurier. According to the report, Cliff shall be cremated and buried in an urn by the city of Neuburg. He no longer needs to be deported. 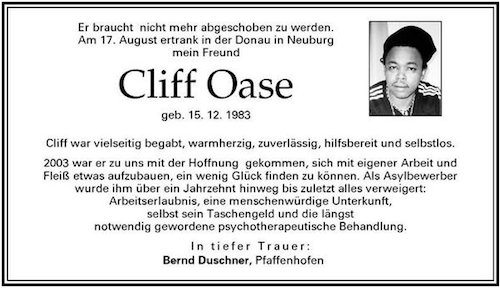 On 17th August, my friend Cliff Oase, drowned in the Donau in Neuburg. He was born on 15th December 1983. Cliff was multifaceted, warm-hearted, reliable, ready to help and selfless. He moved to Germany in 2003 hopeful and determined to work and rebuild his life. But as an asylum seeker, denied a work permit, decent housing, pocket money and much needed psychotherapeutic treatment this for a whole decade. There’ll be a vigil today.